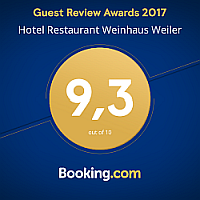 We welcome and pamper our guests in our traditional hotel Weinhaus Weiler in the same manner in which we would like to be welcomed and pampered as guests. In the light of Oberwesel's exciting history of almost 500 years, the notions of cordial hospitality and love for what we are doing characterize our philosophy and turn our team into committed and passionate hosts. It is the joy of the moment which motivates and inspires us and which makes our work a passion. We are as deeply rooted in the romantic Middle Rhine area as we are committed to a loving eye for detail - this is what makes life worth living! We are grateful for being able to share this devotion with you. We are there for you. Promised!